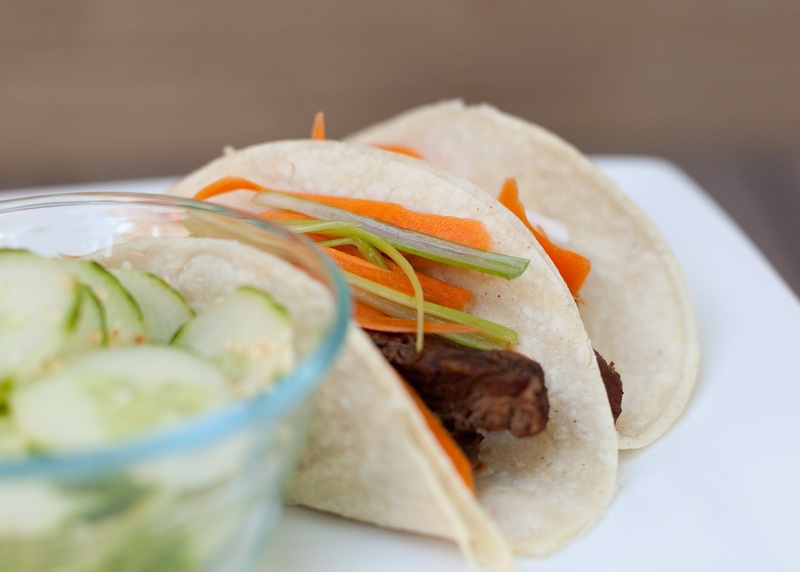 Today's tacos are a spin on an Asian steak I like to make. They make a light meal (perfect for late summer) but also pack a ton of flavor. I've been making this marinated flank steak (literally) for years. The marinade recipe is from a 2010 issue of Cooking Light magazine. The recipe uses soy sauce, maple syrup, sake, dark sesame oil and Siracha. This might seem like a bit of a grocery list if you're not accustomed to cooking with Asian flavors, but it's nice to mix it up and have a totally different flavor profile once in a while! After the steak marinates (a must for this cut), it grills up very quickly in the oven on the broiler setting. After a five minute rest, cut it diagonally against the grain (always this way for flank steak! ), and stuff in warmed white corn tortillas. The steak is very flavorful, so I paired it with something super fresh and bright. 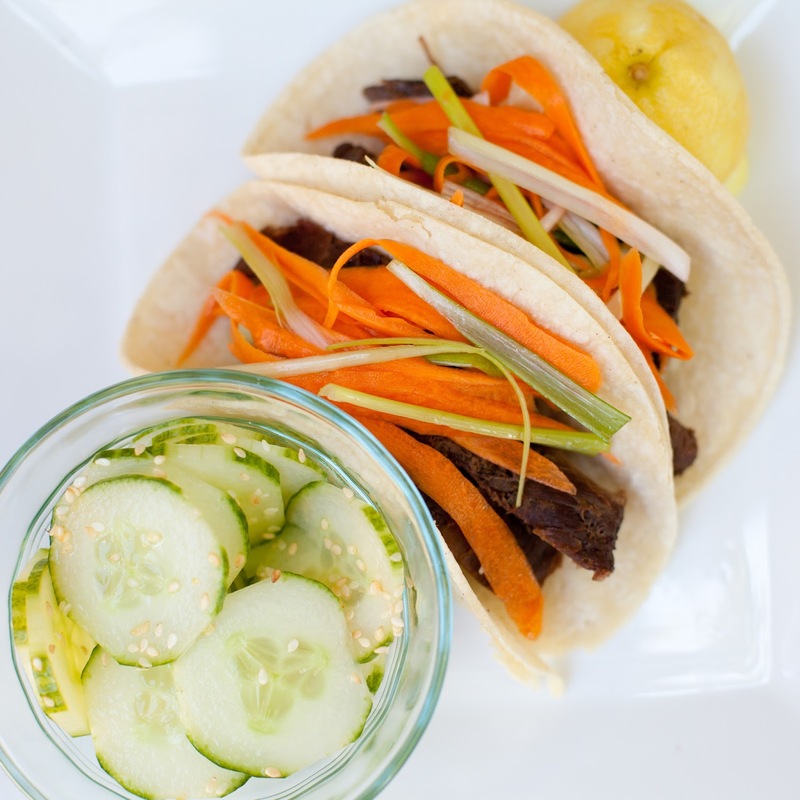 I used a vegetable peeler to make long strips of carrot and green onion, and just tossed them in a bowl with a bit of seasoned rice vinegar, and added to the steak tacos. To continue with the "light and bright", I thinly sliced a cucumber, and tossed with seasoned rice vinegar and sesame oil. I sprinkled on some sesame seeds before serving. Combine first six ingredients in a shallow dish. Pierce steak on both sides and add to dish, turning to coat. Marinate for 20 minutes at room temperature (or cover and refrigerate for later in the day). After marinating, remove steak (preserving marinade) and place on a broiler pan coated with cooking spray (I cover bottom pan with aluminum foil for easier cleanup). Preheat broiler in oven. Pour marinade into a small skillet. Bring to boil, stirring well. Cook over medium-high heat for three minutes. Brush steak with half the glaze and broil in oven six minutes. Turn steak over, brush with remaining marinade, and broil another six minutes (or until desired doneness). Place steak on a cutting board and let stand five minutes. While steak is resting, shred carrot and green onion and toss with seasoned rice vinegar. After five minutes of resting, cut steak diagonally across grain into very thin slices. Place into warmed white corn tortillas and top with carrot/green onion mixture. Slice cucumber and place in a bowl. Toss with seasoned rice vinegar and sesame oil, and top with sesame seeds. Flank steak is one of my favorites - I've never tried it in a taco - must do! these sound and look delish! I'm pinning this - it looks SO good!! !